The Canadian Chinese Times was founded in 1981. We are proudly the longest running Chinese newspaper in Calgary, Alberta. How many readers do we reach? What is the Canadian Chinese Times about? We have grown to over 80 pages covering national news, world news, entertainment, health & lifestyle, and a broad network of advertisement including classifieds to promote a variety of local businesses and corporations. 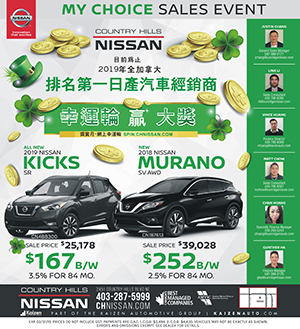 We are a free distribution newspaper that distributes in over 70 locations: Superstores, T&T Supermarkets, selected Chinese restaurants, and other Chinese retails in Calgary near you! We provide quality advertising services with professionals to cater to your marketing needs. By providing complete translations and graphic design work, our team will help utilize your ads to reach the market that you need. Our reliable work ethic together with our creative design ideas is an ultimate medium to brand your products or services and foster a base for your niche market within the asian community. Our respected standing within the Asian community as the premiere newspaper has become a reliable source for our readers to get the most up-to-date news and information and to build relationships between businesses and the general public.